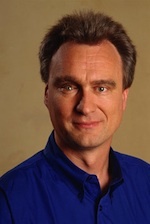 As noted by AllThingsD, former Apple senior vice president of Mac Software Engineering Bertrand Serlet has joined the board of directors at software virtualization company Parallels. Serlet left Apple in March 2011 and was revealed just weeks ago to be working on a new cloud-focused startup called Upthere. "With Parallels Desktop, Parallels became a critical developer for the Mac platform, and I got to know and appreciate the Parallels leadership team. I also discovered Parallels deep involvement with the cloud, represented by its rich portfolio of products. I look forward to drawing on my career at Apple to help guide Parallels as it continues on its impressive growth trajectory," said Serlet. Parallels has been one of the most popular software solutions for Mac users seeking to run Windows in a virtualized environment rather than relying on Apple's Boot Camp solution. It looks like he's running a different OS in each eye. MacRumors gods - please, please bring back the downvote. Wow be easy....its a strange photo, but if you look at some of the details...it screams major accident w/ tons a surgery. The guy has probably been through hell. Together with Avie Tevanian, Bertrand Serlet constitutes one of the GREAT management losses at Apple in the last five years...both executives' talents at developing top-class Mac software and OS won't be replaced anytime soon. Think this thread hit the tasteless mark in record time. As far as the actual news, I'm sort of wondering why he joined the board and if it means anything at all (i.e. will it give them a significant advantage over VMWare). To heck with his eyes. What a brain that man has! Thank you, Mr. Serlet, for OS X. Recently had to decide wether to use VMWare Fusion or parallel on all our staff computers. Chose VMWare.. It works really well, but now i'm kind of regretting it.. Agreed. I think him leaving Apple explains why Lion and Mountain Lion feel more like iOS updates and not an OSX update. This man truly understood what mac users wanted. He is traitor for me now! How he can do that? What the Parallels is? It's company that helps people to run ugly, useless, stupid application on great OS X with great technologies, like Time Machine, Spotlight, Core Animation and others. Parallels is scum on Mac OS. It's tools, that's even can't bring performance, because it's impossible. If you a Mac user and you need (funny to say that) run Windows app, you can run (free!) BootCamp and install Win on it with the best performance on your Mac. You ever install Parallels? I try it. It's like a usual Win apps install a lot of trah to your Mac. Damn it, I hate him now. Traitor. Btw! Did you know that the founder of the company is Serguei Beloussov. In 2011 he handed over the CEO Birger Sten, who held to the time in various positions at Microsoft, and the well-known 10-fold increase in revenue of the Russian representative office of Microsoft in the period from 2004 to 2009. This is Microsoft company. I hate it. We are all Apple devotees, but seriously. This is one of those occasions where a post doesn't even deserve a reply. Just a down vote.